We nearly missed the boat. So wrapped up were we in booking the big stuff for our six-week trip to Hawaii and Alaska—flights, hotels, and car rentals—that we overlooked a few details. Like the fact that we would be visiting Pearl Harbor during a highly-trafficked holiday weekend. 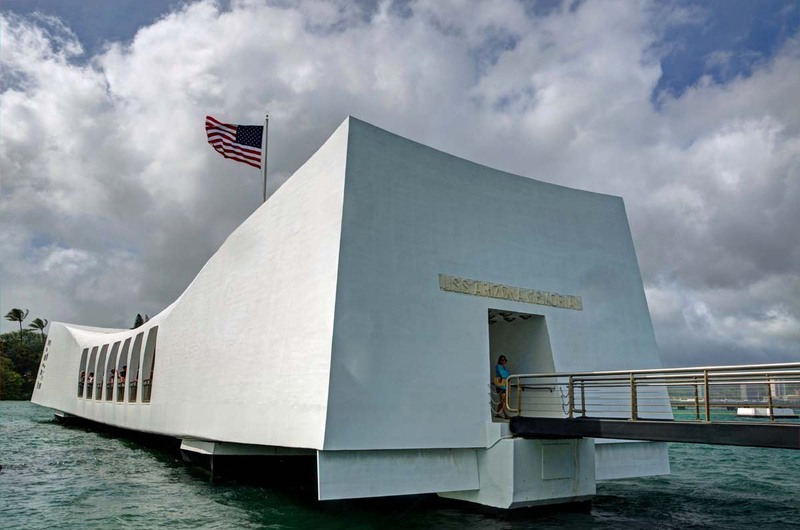 There is an excellent, comprehensive museum, as well as other exhibits and even a submarine, but visiting Pearl Harbor’s main site, the USS Arizona Memorial, means catching a ride out into the harbor. When we looked into the logistics after landing in Honolulu, all of the free, timed tickets for the shuttle boat were booked the entire time we were in town. As it turns out, our procrastinating paid off. Or at least that’s one way to look at it. 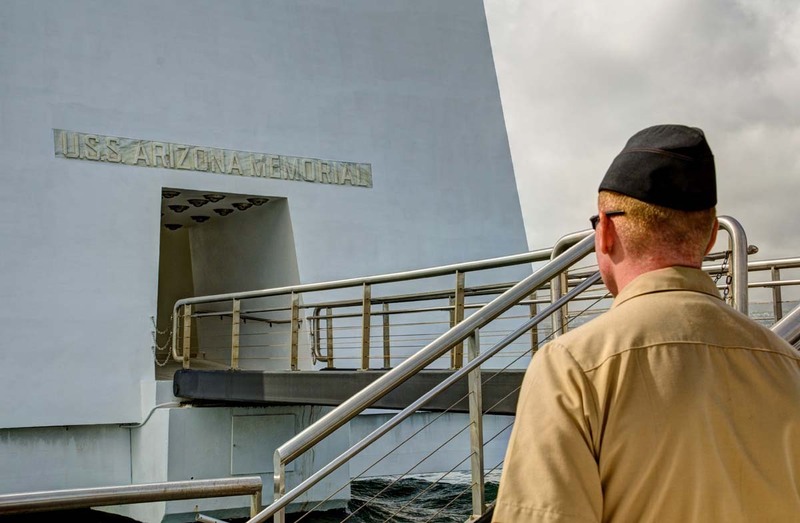 Instead of catching the free ride to the USS Arizona Memorial and back, we purchased tickets at $30 apiece for a special tour. Offered occasionally as a fundraiser, the hour-long outing ferries visitors around the harbor. Along with explaining the devastating events that unfolded there on December 7, 1941, the park ranger narrating the tour highlighted heroics and shared details about the soldiers caught in the fray. A routine Sunday morning—selected because fewer personnel were on duty then—was shattered when the first of two waves of Japanese bombers appeared in the skies overhead at 7:55 a.m. Not considered a likely target for an attack in the Pacific, Pearl Harbor wasn’t on high alert. The Japanese mission hinged on the element of surprise, and it worked. The damage was swift and devastating. 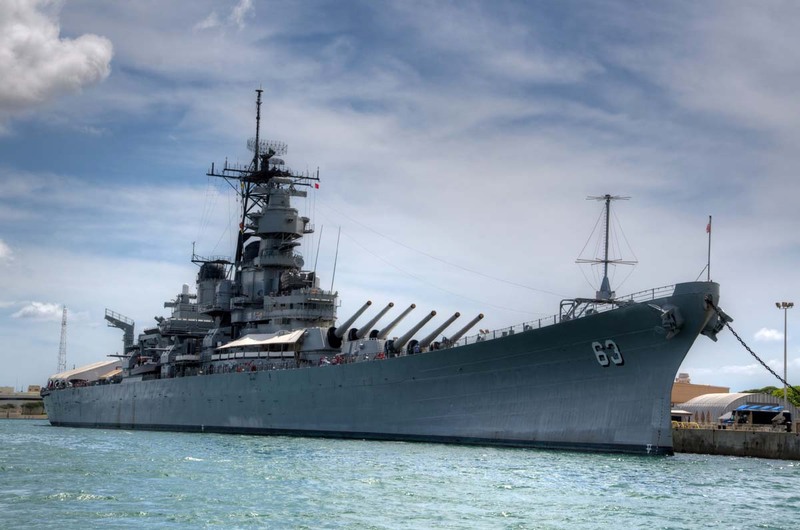 The USS Missouri (“Big Mo”) missed the battle on that “infamous” day but went on to fight at Iwo Jima and elsewhere in the Pacific. Today she serves as a museum ship in Pearl Harbor. Along Battleship Row, seven of the Pacific Fleet’s nine battleships were moored that day. American forces began fighting back, firing at the planes above, but the two-hour ordeal took an enormous toll. The Arizona sank in less than nine minutes after being hit. The Oklahoma rolled over, taking 400 sailors with her. The West Virginia, too, went down, trapping three men who survived in an airtight container for seventeen days until they ran out of food. Elsewhere in the harbor, the USS Nevada, damaged but functional, tried to make a run for open water. Enemy pilots zeroed in on the moving target, thinking they could sink her and block the harbor’s exit. Instead, the crew of the Nevada thwarted that plan by heroically turning away from the safety of open water and beaching the ship. We sailed past the harbor’s Middle Loch entrance, where a Japanese midget sub was spotted and sunk an hour and a half before the first bombers arrived. Tragically, other warning signs were missed that day, too. A radar station’s report of incoming aircraft shortly before the attack didn’t set off alarm bells, presumed to be B-17s scheduled to arrive from California. Meanwhile, Japanese communications intercepted in Washington, D.C., hinted that something big was going to take place that morning, but the message wasn’t passed along to Pacific Fleet commanders until after the attack was underway. 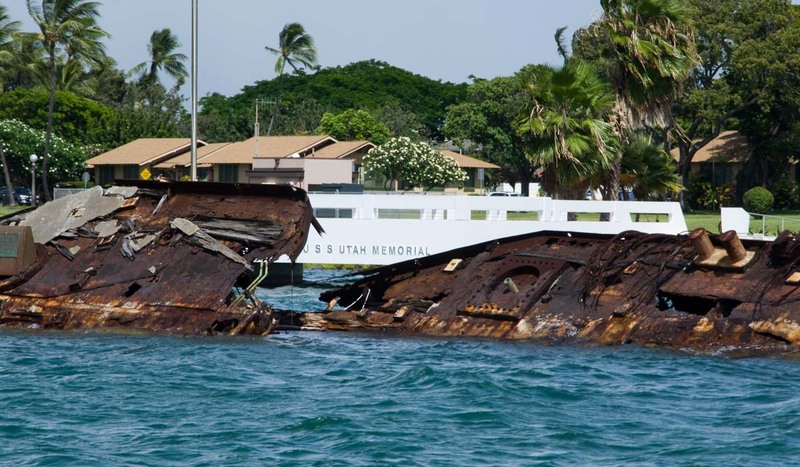 At the site of the USS Utah Memorial, near the spot where the training vessel’s rusted remnants jut from the harbor’s surface, we heard how Chief Watertender Peter Tomich earned a posthumous Medal of Honor. After the Utah was struck by torpedoes, listed to the side and began to sink, the order was given to abandon ship. Knowing that a boiler explosion would turn the boat into an inferno and doom the crew seeking safety, Tomich tended the machinery until it was too late to make his own escape. He and more than sixty other sailors went down with the Utah and still remain with the ship. Like the Utah, the Arizona rests on the harbor floor and the majority of her men along with it. 1,177 crew members perished that day, the greatest loss of life of any U.S. warship in American history. The boat is also the final resting place for more than thirty survivors whose ashes have since been interred with their fallen shipmates. The white, bridge-like memorial structure, which spans the mid-section of the sunken vessel, was our last stop before heading back to the visitor center. We and the sixty or so other tour passengers quietly filed off the ship and onto the memorial. We passed by seven windows symbolizing the date Pearl Harbor was attacked and paused at a circular opening in the floor where the Arizona’s decks are visible in the swirling, dark water. Before the tour began, we were told how the money we paid for our tickets would be put to use: refurbishing the names etched in the memorial. 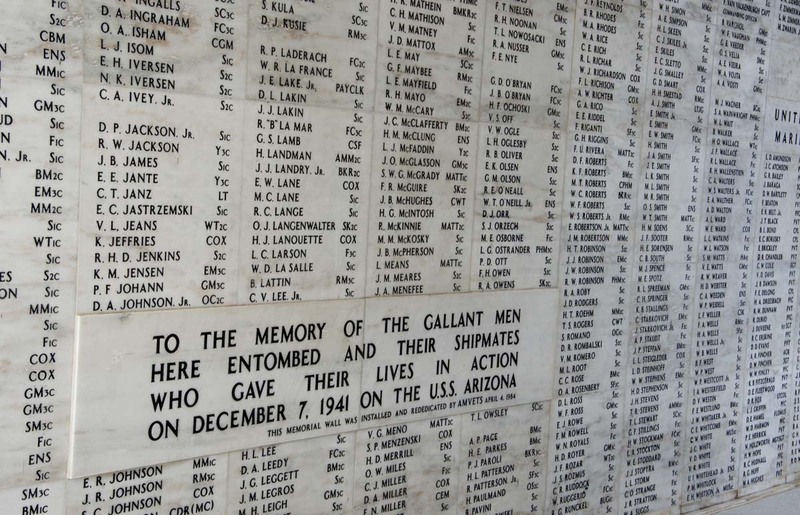 When I lived in Hawaii we went to the Arizona Memorial on one of our school trips. I was 11. We all carried flowers with us to toss into the water in memory of those lost. Looking into the water and seeing parts of the ship was very sobering. And a chapter in a text book came to life. It was sad but peaceful. I’m glad you got the chance to see it. Sad but peaceful is an excellent way to describe it. The quietness is such a contrast to what the mind conjures up when you’re hearing about what happened there on December 7. And how awesome that you lived in Hawaii! Very nice post. I visited with my family when I was 8 years old and I still remember it vividly. So many precious lives lost. It is a powerful place for sure. Hearing the personal stories about the men who lost their lives is what made it especially poignant for me. We would like to visit Pearl Harbor. I’ve only been to Big Island, which was fun. But I wanted to make it over to Pearl Harbor. Maybe next time. We loved Pearl Harbor. It was a very solomn and respectful. A good addition to our fun in the sun Hawaii tour.